I guess this is China’s version of America’s Got Talent. These kids are so cute and pretty talented, too. Who do you like better – the kids or the judges? One month ago, today, was National Pet Day in the U.S. 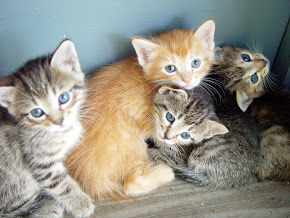 So, I thought it would be fun to talk about the first cats in China. November of 2013, archaeologists uncovered cat bones in Northwestern China’s Shaanxi province which date back 5,300 years. These bones predated previous beliefs of cat arrivals in China by some 3,000 years. The 8 bones they uncovered belonged to at least 2 cats and the measurements confirmed that ancient Chinese cats were of the same size as modern cats. 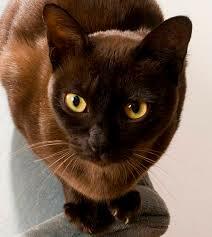 Using radiocarbon dating, scientists revealed the cats lived between 5560 and 5280 BP; the Neolithic period in China. 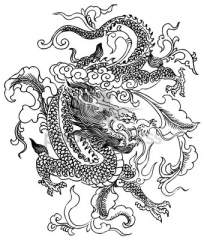 The Chinese Neolithic period involved the Yangshao culture. These people had stable villages, raised pigs and hunted for food. Evidence showed the cats appeared to be accepted members of those villages; probably earning their keep by keeping the pest population in control. These ancient cats breed with cats brought into China by traveling monks eventually producing the Burmese and Siamese cat breeds. Now, China has become the 3rd largest pet market in the world after the U.S. and Brazil. In 2012, Chinese pet owners spent $7.84 billion Yuan on animal care. I know what you’re going to say – Don’t the Chinese eat their cats? But things are changing! Young Chinese celebrities are taking up the ‘pro-pet cause’ on social media and the Chinese Animal Protection Network has begun organizing large protests against eating dogs and cats. These actions are spreading and gaining momentum among the Chinese public. 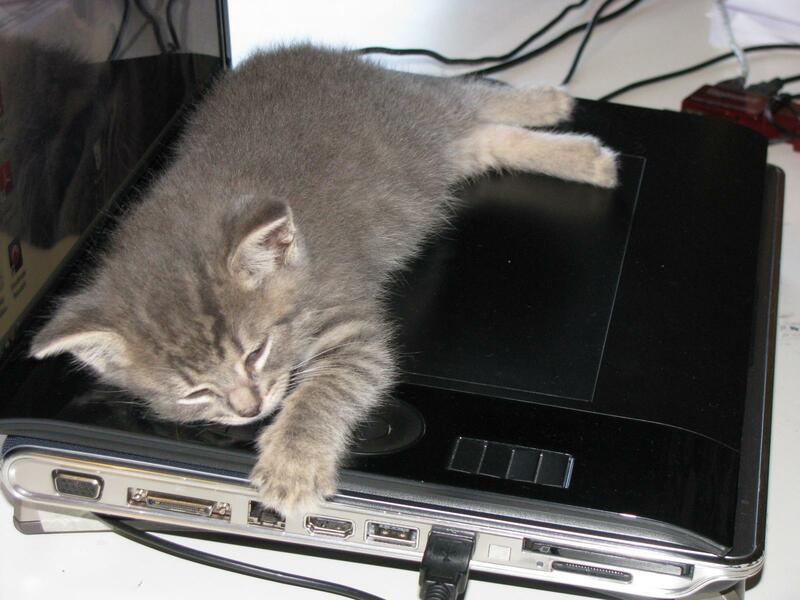 There are even cat cafes in cities such as Beijing, Shanghai and Hong Kong! (Read my blog post on cat cafes) Places where cat lovers can go and spend some time with cats, especially those, for whatever reason, can’t keep a cat at home. 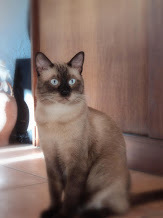 So let’s hear it from all you cat lovers, tell me about your cats. What breed are they, names, rescued or whatever you want to say about them. If you can add a photo to the comment that would be great (not sure it’s possible). Thanks! 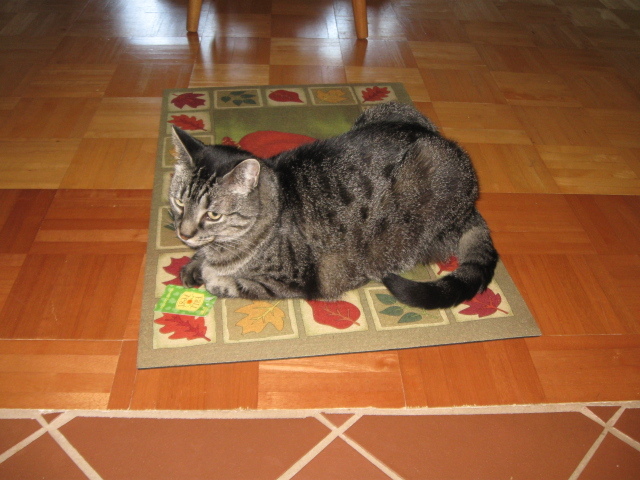 Here is our Aggie Girl (short for Miss Agatha Christie) who showed up on our doorstep one icy November day 8 years ago. She is such a sweetheart! We love her. Can a Bridge be Romantic? China has some of the best bridges in the world. Anji Bridge is the oldest bridge still in existence in the world. 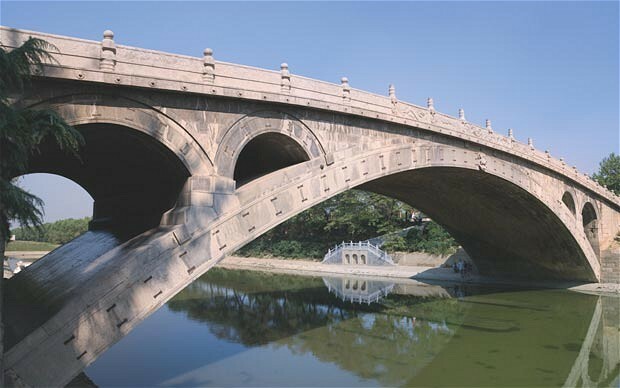 The name translates to “Safe Crossing Bridge” and it was constructed between 595 to 605 during the Sui Dynasty. 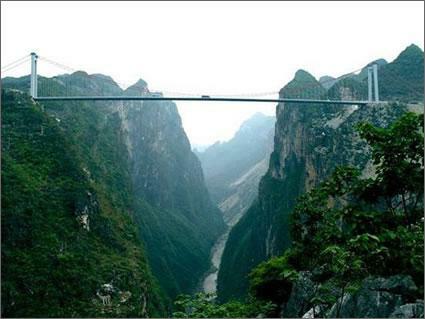 It’s total length is 167 feet (50.82 m) and it crosses the Xiao River. This bridge has survived 8 wars, 10 major floods and numerous earthquakes; only the ornamental railings have been replaced every few hundred years. In 1991, the Anji Bridge was named among the world cultural relics of civil engineering which makes it as famous as the Eiffel Tower, Panama Canal and the Pyramids in Egypt. 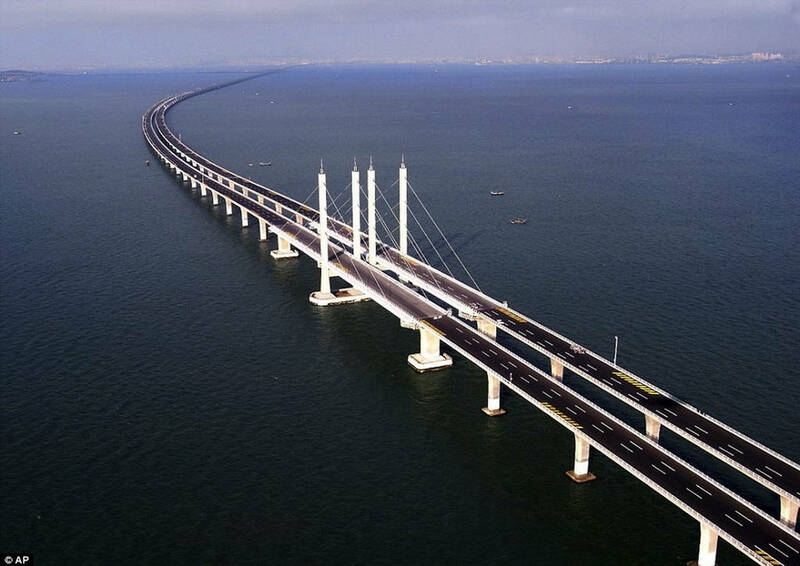 The Danyang-Kunshan Grand Bridge is the world’s longest bridge spanning 102.4 miles (164.8 K). This bridge is the viaduct on the Beijing-Shanghai High-Speed Railway which opened in 2011. This bridge seems to go right up to the horizon! The Sidu River Bridge is the highest bridge in the world. It opened in 2009 and spans a 500 meter deep valley. Now, those are some really cool bridges but I think I’ve found the most romantic bridge ever! 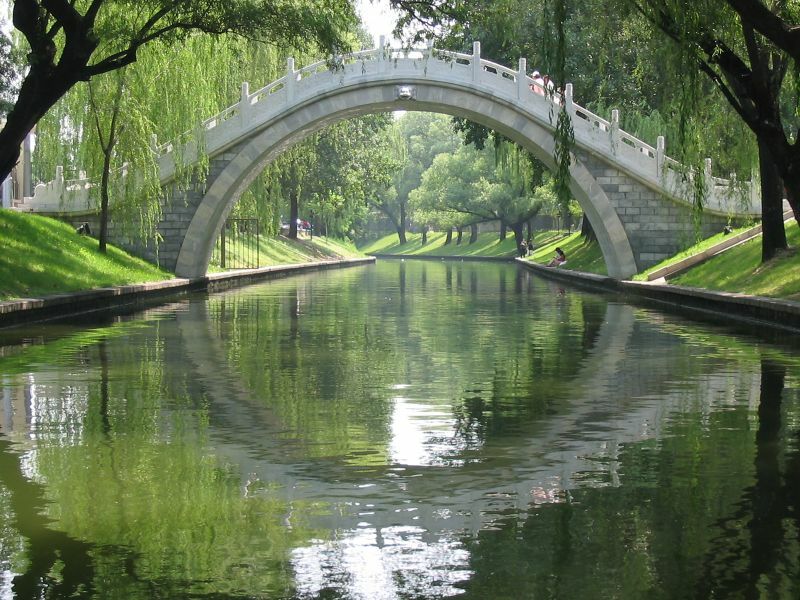 This bridge is in the Black Bamboo Forest in Beijing, China. The reflection in the canal completes the circle making me think of a ring. What could be more romantic than that? In my novel, Hong Kong Treasure, Deshi and Annie travel to Beijing and I like to imagine them crossing this bridge while holding hands. So to answer the question in my title – Yes, I believe bridges can be romantic! Anywhere you are with the one you love can be romantic. Anyone have any romantic experiences on bridges? I’d love to hear about them.